I am going to take a small side path here for this post. The still life set up I showed last week is winding up. I did a monochromatic thumbnail oil sketch of the set up and then decided to do a full size graphite sketch before starting the painting. The thumbnail only took an hour and it was approximately 5"x7". It gave me a sense of the lights and darks , proportions, and angles of the set up. After doing the oil sketch I felt I needed to do the graphite sketch as well to help me get the proportions right. The set up is more complex than I am used to doing. The sketch is not intended to be finished at all. It is a process tool for me. I will be moving on to the actual painting this coming week. Last post Theresa commented on the placement of the lemon. I realized a bit later that I forgot to mention that I did not take the photo from the same vantage point that I will be painting. I had to use a tripod for the camera to take the picture and could not get it in the same place where I will be standing to paint. I appreciated the comment though. It made me take another look from a different viewpoint. The lemon stays where it is, which looks closer to the other objects from my viewpoint. I have also set up a very much simpler still life to work on which I will talk about next post. This will allow me to trade off between the two paintings and give my poor mind and eye a break from the more complex one. For some reason this is the only picture I have on hand so sorry for the mess in the middle. At this time I use Gamblin paints, mediums, and solvents with a couple of exceptions. I also have Windsor and Newton Permanent Rose, Bloxx's Capucine Yellow (an absolutely seductive transparent goldy pink that I wouldn't mind having for a lipgloss, and I don't wear lipgloss! ), and Williamsburg Courbet Green. I mostly use Gamblin's Flake White Replacement but also have Titanium White. I have Gamblin's Chromatic Black but haven't really found the need to use it. I like the life in the blacks that I mix on my own better than what comes out of the tube. I should mention at this point, I love color. For those of you who have read my Renee Weaves! blog (currently in mothballs but can still read archives) you know I love color and had a great time playing with Earthues Dyes one fine summer. There are different schools of thought on how many colors one should have on one's palette. 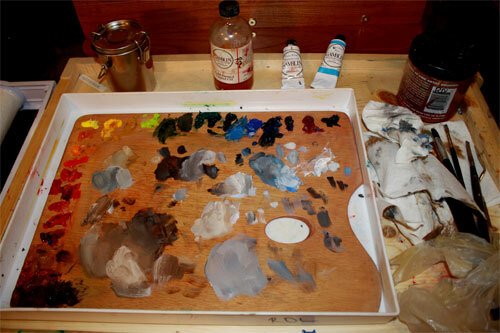 There are some who feel a limited palette is the best to start with and stay with. 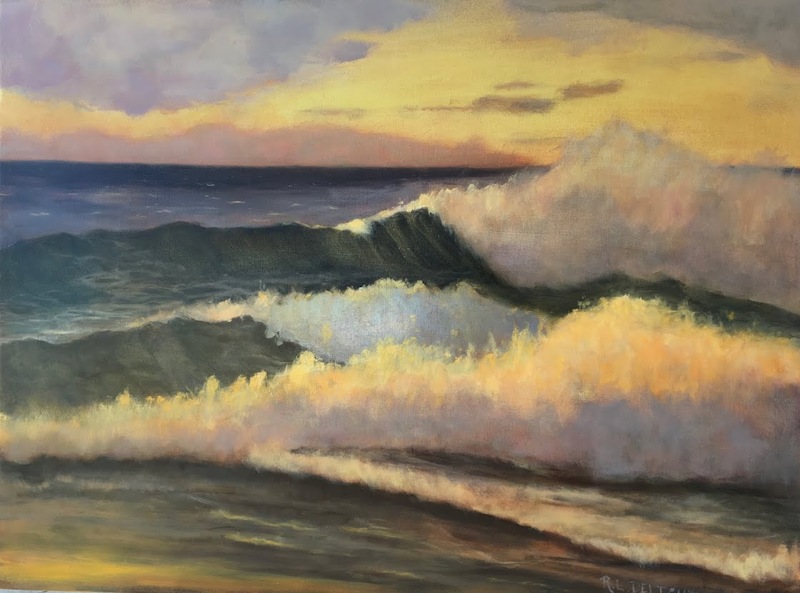 Personally, no matter how skilled the artist or how wonderful the painting, I just don't like the looks of a painting done with a limited palette, and I can always tell. I am at a slight disadvantage from my former classmates as I didn't get to the color part of my education before the school moved. Fortunately, I do know a lot about color and color theory from working in textiles and playing with dyes. Some of that carries over nicely. I love having all these colors. I enjoy playing with different mixtures and problem solving. Does it always work out? Heck no! However, I learn a lot. At this point, because I have so much to learn, it takes me a bit longer to work than it will eventually. I hope! The actual palette itself is made of wood. I might be changing that sometime in the future. I keep it in a Masterson's Palette keeper and store it, well wrapped, in the freezer to extend the life of the paint. While I am at it I might as well touch on the brushes I currently use. I ordered a handful of brushes in the same size and shape from different companies. I find I really like Silver's Black Pearl which is synthetic. I should mention that all my brushes are synthetic fiber due to my personal beliefs. I also like Royal Langnickle's Bourdeaux and Isabey Isacryl. I will try a few others as my budget allows and welcome any suggestions. As the title of the post suggests, I am still experimenting and learning what will work for me and my eventual subjects and style. I have already made some minor changes and noticed that I have dipped into every color on the palette but I definitely use some more than others. OK, I am sure some of you are starting to glaze over and nod off so I will stop here. Next week should bring some progress on the still life painting. One of the best classes I took was understanding colour. The instructor recommended playing with as many pigments as one could afford and working into your own palette. As for the lemon, it seemed a little bright to me in that setting, but a photo isn't telling all and as you say the angle is different. LOL, there are so many beautiful colors why limit yourself! I love that the only picture is one of the color palette set up in use! Good good good! Thanks Eveylyn and Theresa, as Theresa said, perspective changes everything! You all will just have to wait to see the finished painting. Of course, it will be a photo of the painting....! Oops! Sorry Evelyn! My fingers got crazy with the "y" key.